Well, traffic on the PCT in the Burney area is definitely picking up. I just finished posting my report on Little Ant and Ducky, when I got a phone call from a young lady going by the name of Butterfingers. She and two fellow hikers, Sweet Cheeks and Skinny Thor were at Burney Lodging and needed a ride to the 299 trail head. 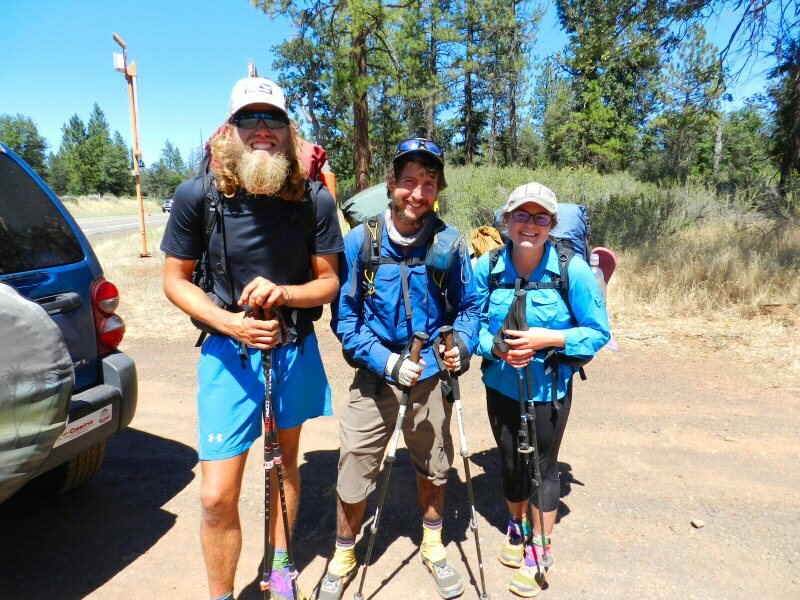 All three are thru-hikers who have had quite an adventure making their way through the desert of Southern California and then through the Sierras and are now trekking their way through the Cascades on their way to the Klamaths and north to Canada. Skinny Thor, from Waterloo Iowa began his hike from the southern terminus at Campo on April 13. Butterfingers, from Fishers, Indiana, also began her hike on April 13. The third hiker, Sweet Cheeks is from Israel. He began his hike on April 14. When I asked how many hikers they thought were hiking the trail this year, Butterfingers said that she had heard that around 3,500 permits had been issued. This was interesting to me. Until recently, I didn’t know that permits were required on the PCT. In her July 7, blog John Muir – tandem trekking, Lindsay mentioned that at one of the junctions in the John Muir area they had met a group of Forest Service Rangers who had asked to see their permits. So this was the second time in a couple of days that someone mentioned permits. Later, I decided to check it out. It turns out that permits are required on some but not all parts of the PCT. Permits vary depending on what state or federal agency is managing the land that one is hiking through. The Pacific Crest Trail Organization has information on shorter distance permits and issues inter-agency permits for people hiking 500 or more contiguous miles in one trip. So I’ll take a guess and say that Butterfingers was talking about longer-range interagency passes to people who wanted to hike the whole trail. When you add section hikers and short-range hikers the number jumps and is difficult if not impossible to accurately calculate. Anyway, back in the jeep, I asked my three new acquaintances how long they had been hiking together. Sweet Cheeks and Butterfingers had been hiking together for about 3 weeks. Skinny Thor had joined them a week ago. They said that they were amongst the first hikers that had ventured into the Sierras as the melt began. The bulk of hikers were now around South Lake Tahoe, about three weeks hike behind. They also said they had met some hikers that had skipped north as far as Ashland and were now hiking south to go through the areas they had missed. I told them about a few of the hikers I had given rides to and they all got really excited when I mentioned Brit Family Robinson because they had met this family several months before hiking in the desert. The three of them had sited a bear near Belden. Skinny Thor said he had also sited one near Tehachapi in the south. Surprisingly they hadn’t seen any rattlesnakes in Hat Creek country, though Butterfingers had seen several in the desert and Skinny Thor saw one in the Tahoe area. I told them that the bear population in this area has been increasing since the State of California banned the use of hounds for bear hunting in 2012. Skinny Thor asked if the ban was passed because the number of bears has become dangerously low. I told him that I did not believe so. California fish and game regulations, land management, gun and ammunition laws, animal rights and environmental concerns are a complicated maze involving many different interest groups and state, federal, and even international agencies pursuing various goals and agendas. With that thought in mind, we said a parting farewell and the trio disappeared into the woods heading toward Canada.